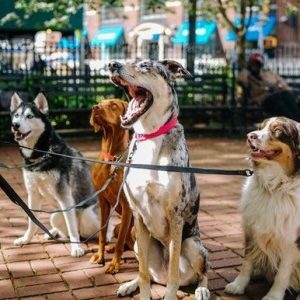 North Toronto Dog Walker offers services to meet the individual needs of your four-legged friend: Adventure group walks are 2+ hours in length where your best bud will socialize, run and play with the pack. Private adventure walks and puppy visits can be tailored to fit your dogs needs. Occasional walks can also be accommodated. I’m Melanie, an avid dog lover just like you! I was fortunate enough to grow up with dogs and horses so working with animals has always been my passion. After years of pet-sitting and dog walking for friends and family, it was a natural fit to create a business where I could help fulfill the lives of furry loved ones. A tired dog is a good dog, so after an adventure walk with the pack or a private hike, you can count on coming home to a happy, more relaxed dog! Insured and Bonded with Profur Insurance and Certified in Pet First Aid with Dog Safe.